The Arabs refuse to recognize anything anywhere in the world where their feet have tread should ever be ruled by any others and must remain an Arab Waqf for all eternity. This is why in many Arab countries a map of the world does not contain the nation of Spain and instead shows a nation named Andalusia. This name was what the Moors who conquered Spain used to name that area and that was the name until 1492 when Ferdinand and Isabella who reconquered Spain for the Church and initiated the infamous Inquisition. This warring between Christianity and Islam had continued for centuries with the most famous were the Crusades to return the Holy Lands for Christianity with their emphasis on Jerusalem and secondary targets of Nazareth and Bethlehem. The Muslim conquests had reached from Spain into France being turned at the battle of Tours. The invasions in Eastern Europe reached Vienna twice where the Muslims were turned back and the Ottomans returned eventually retreating back into what is today Turkey. World War I brought an end to the Ottoman Empire and in a number of first ever treaties the lands were turned over to rule other than that of the conquerors with most returned to what were believed to be the indigenous peoples. The most striking was the reestablishment of the Jewish State in its ancient homelands. These new nations were to be guided by Mandates assigned to the European allied victors of World War I. Also redrawn were the borders of Eastern Europe with Germany and the Austria-Hungarian Empire being broken into new nations and borders adjusted with the allies and their defeated ally Poland gaining area at the cost of Germany and the Austria-Hungarian Empire. The Arab claims that the Europeans after World War I crippled and altered the Arab world while leaving Europe unchanged is not a valid claim and the reason the Arab world appeared to be more altered was the area of the Ottoman Empire compared to the Austria-Hungarian and German lands combined. The alterations in both lands were relatively equal in their depth and altering of influences. In Europe they set the ground for the remilitarization of Germany and World War II. The problems in the Middle East and North Africa (MENA) was caused largely because each of the nations drawn on the map placed several tribes within the same borders and even cut some groups such that their peoples were spread amongst several nations. Probably the biggest losers from these borders were the Kurdish People who, despite being promised their own lands of Kurdistan, they were cheated and their tribes spread between Iran, Turkey, Iraq and the former (and potentially future) Syria. This has caused great amounts of friction especially with Turkey and Iraq where the Kurds were often targeted by their own governments. The Kurds in Syria have been facing an extermination assault by Turkey on top of fighting the Islamic State as well as other independent units and the Syrian government and allies. When reading about the Kurds it often appears that like Israel these people are also fighting the entire world with the main difference is at least the United Nations ignored the Kurds. According to the Arab history of the world there was nothing before Islam. There were no great empires of Persia, Greece, Rome, Babylon and so forth. All these lands came into history upon their conquest by the Arabs and Islam. All the former and undeniable peoples from the bible were all Muslims. This may appear to be an anachronistic view of the world but the way this is established is that Allah founded the universe and gave Adam the perfect faith, Islam and when Abraham was to sacrifice his son, that son was Ishmael and there is little if any mention of Isaak. Abraham was a Muslim, Moses was a Muslim and the Torah he wrote was really the first writing of something resembling the Quran but the Jews altered the writings given them by Moses corrupting it and the Christians took that and corrupted it further all to such an extent that Allah had to provide the original all over again to Muhammad. Thus Islam is the only true religion and thus has been promised to be given the entirety of Earth to rule as the only ones who have truth. This is the reality under which the Arab Muslims perceive the world and insist this is the truth and their truth must be the only truth. Anybody who refuses to accept their truth is a heretic and under Islam such a blasphemer needs to be silenced by all and any means necessary. All of this comes to a head over Israel and the focus of Arab war with the developed world and the Western world and culture. Islam had made a number of offences with their first the most successful and is now at the leading edge of their third surge (see map below). This latest offensive is using numerous efforts including warfare, terrorism, infiltration (refugees) and using democracy against itself and the equality and protections of religion to spread political Islam. Until Western nations realize that Islam is a religious-political system where the political Islam supremacy is hidden within a religion where it retreats whenever challenged demanding their religion be respected and pressing those who propose to tell the truth are then attacked as Islamophobic and thus ridiculed as anti-religious or bigoted haters. Thusfar their methods have been working exactly as they planned and will continue until either the Western World succumbs or wakes up and treats Islam as a political supremacist totalitarian system threatening the developed world. Concerning Israel, the Arabs have directed their main efforts on the heart of Israel realizing that Israel is the tip of the defense of Western World civilization. To target Israel they are aiming for the heart of Israel which is Jerusalem and targeting the beating heart of Jerusalem, the Temple Mount and Old City all of which is all encompassed in Eastern Jerusalem and thus beyond the Green Line. But what is this Green Line and why is it so important? The Green Line is the line between the IDF and the Arab forces on the Jordanian front at noon of the final day of hostilities. This was an Armistice Line and the Arab League at that time insisted that the Green Line was only to be the demarcation of the end of fighting and never, ever, ever to be considered as a border nor was it to be even used to form or delineate in negotiations a border and Israel was never to have an eastern border. The reasoning was that as long as Israel was denied any of its borders it would not be a real nation and thus the Arab world could maintain that Israel was not a nation and did not exist and was really just part of southern Syria. The Arabs reject the Mandates as having been legal and claim that the Europeans were the longest and most vile colonialists in all of MENA. What they are ignoring is the fifteen-hundred-years of Arab colonialism which continues to this day. 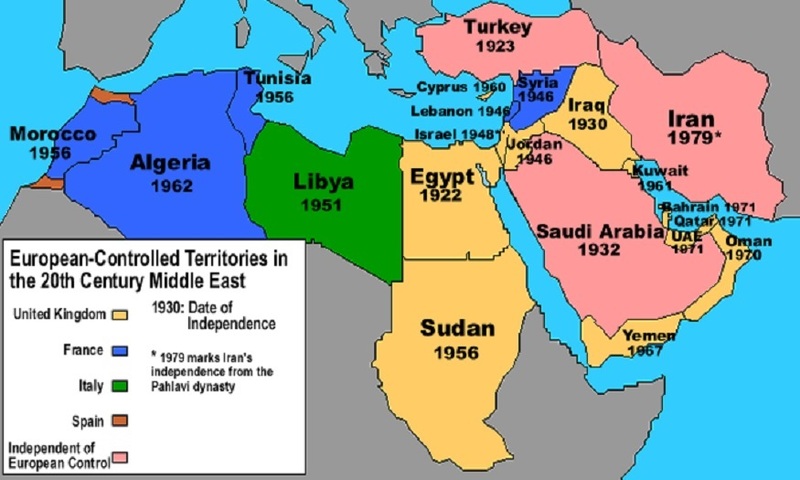 The Europeans began any colonialist possession of the areas of MENA during and after World War I in 1914 through 1917 and then took responsibility for nation building as these areas were under Arab and then Ottoman dictatorial rule since the latest around the year 700 up through 1914, 1200 years, and have returned to Arab control as these nations were released from European influences (see map below). Judging from the longest colonial possession by Europeans of MENA lands hangs around half a century with most far less. The biggest lie about European colonies in the MENA lands is that Israel is a European colony, the big lie. The truth is there is no evidence from the population statistics of Israel by which one can prove it to be a European colony. Approximately forty percent of the Israeli population comes from the MENA nations that forced the vast majority of their Jewish population from within their borders, some with the belief that they could drown Israel with these destitute refugees who were denied their wealth as their valuables and monies were confiscated before they were allowed to depart. Often they were limited to one or two suitcases per person and these suitcases were all inspected for anything of value or desirability. Over half of Israeli population is constituted from non-Europeans within other than MENA Jews there are the Menashe from India, the Ethiopian Jews and many others. Lastly, of the non-Mena populations the largest single population is from the former Soviet Union. The claims are that Israel is made up of Jews from the Concentration Camp survivors that the Nazis did not murder and that they are destined to complete the work of the Nazis. Let us go to the reality for a moment as we have been reporting so much of the strange and untrue, well, a lot of untrue mixed with sufficient truth to make everything have just that taste of the possible. Much of the rest is accepted largely on the mistrust of Jews or outright anti-Semitism. Before the year 600 the Arabs resided almost exclusively along the coasts of the Arabic Peninsula. They were idolaters and Islam was not yet an idea emerging from Muhammad’s experiences in that cave. Meanwhile, the Jews had survived their experiences in Egypt and were led by Moses into the desert where for forty years they prepared the population for becoming a nation and to conquer the Promised Land. Moses led them to the Jordan River and from there Joshua led the assault into the Promised Land. 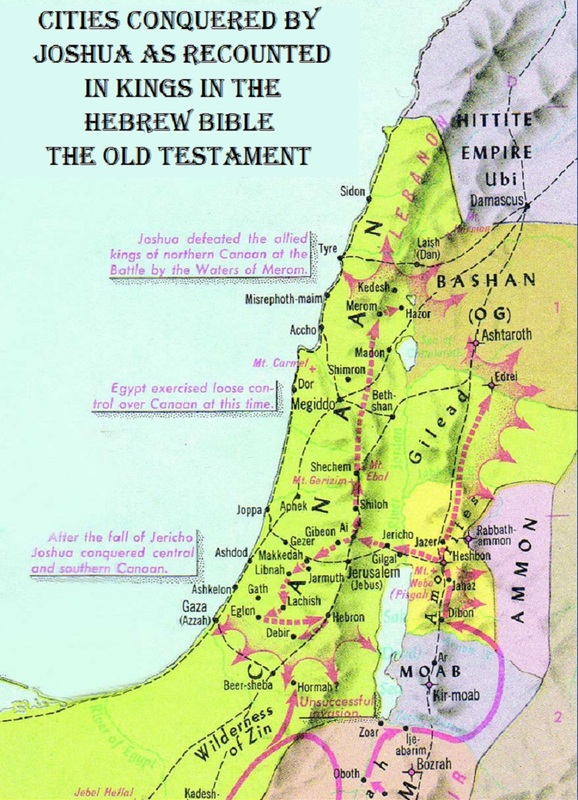 First Jericho then Ai and onto the remainder of the lands (see map below). 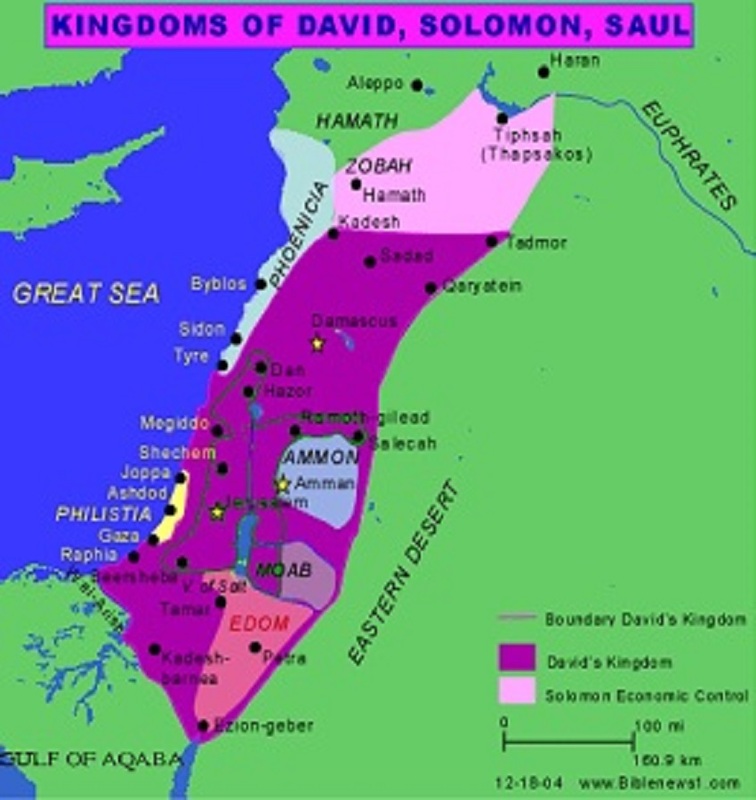 The conquest took longer than a single lifetime and culminated with King David and King Solomon centered around the year 1000 BCE (see map below). By the time of King David and King Solomon all the Canaanite tribes were defeated and the Israelite enemies now were Greeks, Egyptian and Babylonians. The Israelites were driven from their lands twice, the first by the Babylonians and the second by Alexander the Great and his Greek armies. From that second conquest there came the Roman rule which executed what they considered to be the deathblow being delivered to the Israelites, who by this time were merely called Judeans which eventually became Jew. The punishment the Romans delivered was the scattering of the Judeans (Jews) throughout their Empire and even banishing many Jews to beyond their frontiers expecting they could never survive. This resulted, over time, with Jews living virtually throughout the world. Meanwhile, many Jews also sought home along Northern Africa to escape Roman brutalities resulting in a sizeable Jewish population being spread throughout North Africa when the Arab forces burst from the Arabian Peninsula and conquered this area. Some Jews even followed this migration into Spain where they met Jews who had been dispersed and reached Spain from the Roman frontiers. The history of the Western Jews and the history of the Jews under Islam had many similarities where the forms of government and names of the rulers were different but the results identical. In Europe the Jews were chased from nation to nation and even from kingships to kingship and baron’s lands to baron’s lands and even from town to town. The plight of the Jew was well told in Shakespeare’s Merchant of Venice where the Jew is a moneylender whose client has refused payment. For the rest, read the play or go to the theater for the full story, dinner at 11:00 PM. Jews were permitted a select few professions and were forbidden to own land, what was considered the ultimate sign of wealth. This placed Jews as the initial provisionors and retailers. This would grant the Jews great advantage in a much later time while others were just first reaching the cities where the Jews were already established. The Islamic world was ruled locally in many ways similarly to the European world with the main difference being that the entirety was under the rule of one person who seldom ever visited much of their lands. This left the rule and tax collecting from which they often took a great cut for themselves. Often these local leaders would enact Islam only laws pressing the Christians and Jews to flee with little or nothing more than they could hastily gather and carry. Sometimes these restrictions and persecution were targeting Jews alone; it is so much fun to be the chosen people. 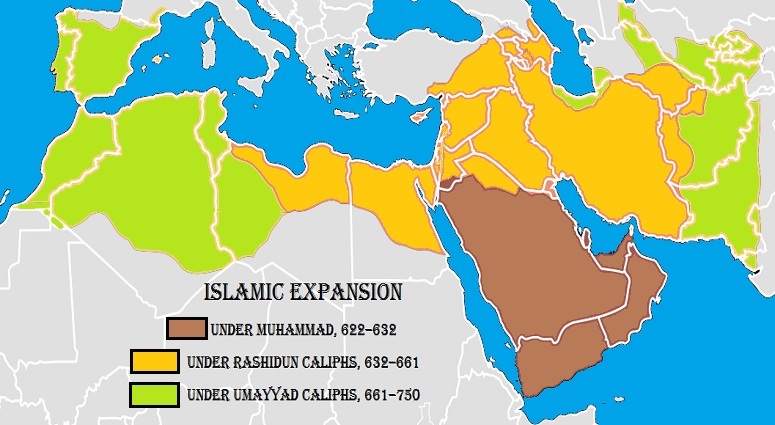 The areas under each Sheikh, Emir and other titles whose moniker would change depending on the Caliph and the ruling Islamic branch would each make decisions which affected the non-Muslims, especially the Jews, residing within their territories. The similarities between the lives of Jews under Islam and Christianity were far greater than were the differences as far as the average Jew and their security, or lack thereof. The problem for the Jews is we were seldom permitted weapons when we most would need them and never had the numbers of population to provide ourselves with much hope of protecting ourselves beyond taking flight when trouble brewed. With Israel things are different as now we have equal footing though our numbers are limited, our determination is not and we will not be driven from our lands ever again, and that is our intent. 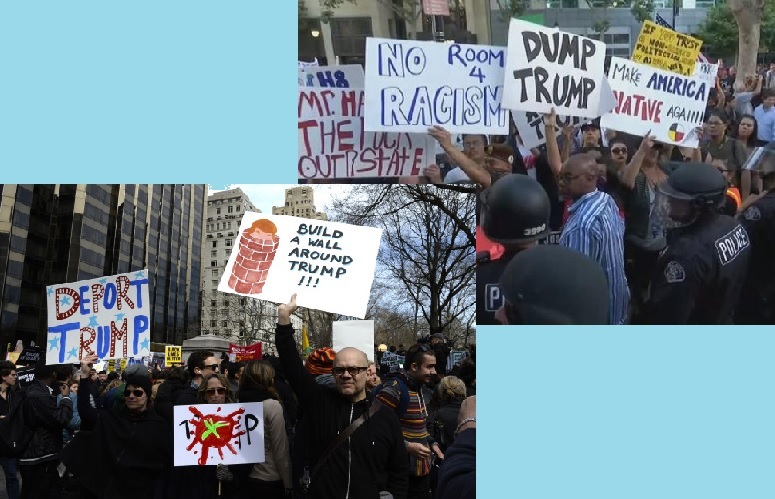 The mainstream leftist and progressive media continue kicking up the dust in attempts to mask the violence they are stirring up underneath the clouds of confusion. They talk of President Elect Donald Trump as if he were the greatest monster to ever reach office. They avoid recognizing the facts that he was duly elected President of the United States (POTUS) and continue to harp on Hillary Clinton winning the popular vote. Truth be known, take away California and New York and for fairness sake also remove Texas and the Deep South and Trump wins the popular vote. Hillary basically won New York and California by huge, and we mean YUGE, margins making the votes in the rest of the nation merely marginal in the contest for popular vote. Problem is this was not a popularity contest or a high school Class President race where the person gaining the votes of the jocks and the blondes wins the day. This was a regulated and carefully crafted contest as defined by the United States Constitution which established the Electoral College, the second best manner for choosing a leader coming from the second best set of laws by which to govern (having Hashem pick your leader and Torah are the best ways to find leaders and by which to govern a nation if only one existed today). 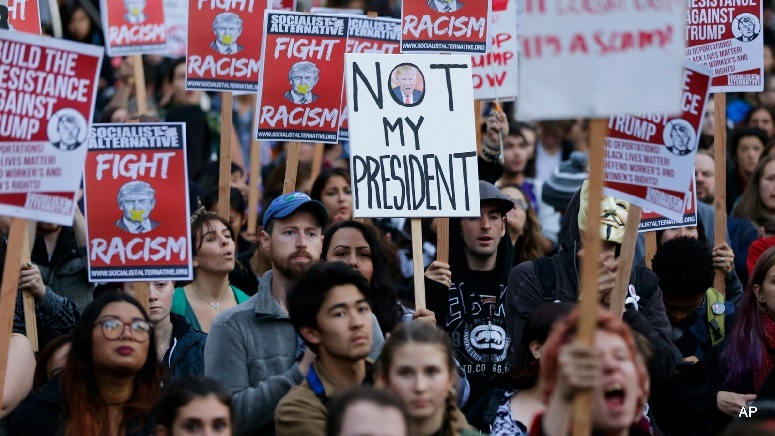 The problem is rules do not matter when you are running a revolution, and that is what the progressive leftists are running, a fascistic takeover of the United States if they are permitted to get away with it. Truth of the matter is the progressive media is simply keeping their base energized and ready to launch protest after protest at every single piece of legislation proposed by the Republicans. As they lost the elections and lost them big across the entirety of the country and now run most cities, the failing ones, and a few states on both coasts but lost the Presidency and Congress. This simply means they will take some time to discredit everything the government does, protesting the horrors which will come from repealing regulations which stifle businesses claiming that workers will be harmed despite their being the kind of economy where everyone who desires work can find a decent paying job. Also, because there will be more jobs than applicants, wages will rise. As long as wages are mentioned, bear in mind that even if Congress passed a minimum wage bill raising the minimum wage to $15.00/hr. over the next five years the media would go ballistic claiming that by the time five years have passed the minimum wage would need be $25.00/hr. at the very least. These are ‘glass is half empty’ when they are not in power and ‘glass overflowing’ even if it is obviously empty. Just read the job and economic reports on the economy during President Obama’s time in office. They almost praised his having one quarter where the change in jobs, income average, and virtually every other statistic was exactly zero, no gain, no loss, in almost every category, a statistical impossibility without cooking the results. It was later revealed that the report was a draft and not containing actual numbers and nowhere could one find the real numbers, how convenient. Much of the talk coming from leftist progressive blogs, news both formal and informal, commentary, columns in major newspapers and other outlets is shrill to the point of being instigations towards violence against Trump, his family, Pence, the Cabinet nominees, the Ambassadorial selections (especially David Friedman as Ambassador to Israel as he actually likes Israel which should disqualify him for any Ambassadorial post, not just Ambassador to Israel) and any-or-everybody linked to Donald Trump and his administration during the transition and probably continuing on into his Administration after the Inauguration. Needless to point out, but the media was really behind something better than a mere Inauguration; they had the coronation of Queen Hillary I and her Royal Court into office next month. They cannot forgive Trump for having the gall and audacity to actually defeat Queen Hillary and denying her that rightful place reserved for her, the first woman to be President of the United States. They will never forgive the American people who voted for Trump even if, or especially if, they did so to assure that Hillary Clinton never again soils their White House unless on a tour and heavily guarded checking for silverware as she leaves. The people have spoken if one ever looks at the map county by county of who voted Hillary Clinton and who voted Donald Trump and the actual immensity of Trump’s victory becomes evident. The areas of blue barely if ever stretch outside the immediate suburbs of the major cities except in a relative few bastions and even in these states like New York, California, Massachusetts, Maryland and a few possibly in New England (see representative map in shades of purple, red and blue below). 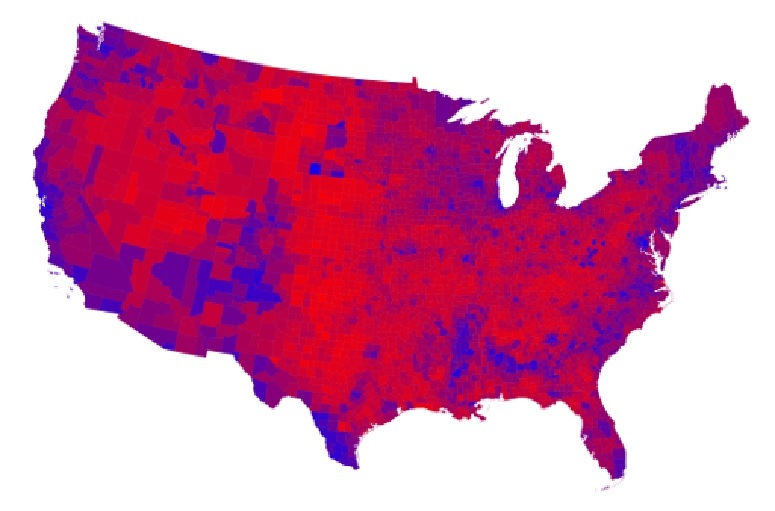 The above map is not as extreme as the purely red versus blue map which is slanted even further in making it appear Trump won almost unanimously outside twenty cities, which is probably not a poor description, just a tad too slanted but no more so than the near constant pounding of, “Hillary won the popular vote and should be POTUS,” “Trump Not My President,” “Dump Trump,” and “Love Trumps Hate” (see images below) That last one is somewhat confused as it could also be used as a pro-Trump poster all depending on how it is lettered. The unfortunate item has appeared in some newscasts which report on the fueled hate, rage and tendencies for violence. 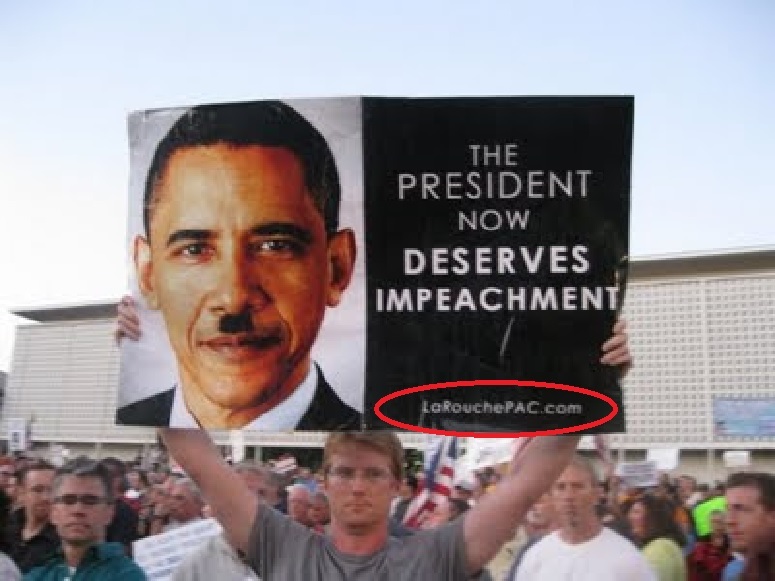 There is an old political adage often used on the right which goes, “If you desire to know what the progressive left is planning, simply seek out what they are currently accusing the conservatives of committing.” During the two terms of President Obama the progressives accused the conservatives, often targeting the Tea Party, of equating Obama with Hitler (this was done at some rallies but unedited pictures have shown Lyndon LaRouche supporters using signs which clearly were marked as being from his organizations (bottom Image). The lesson we can take is one does need to carefully inspect from whence messages actually derive. 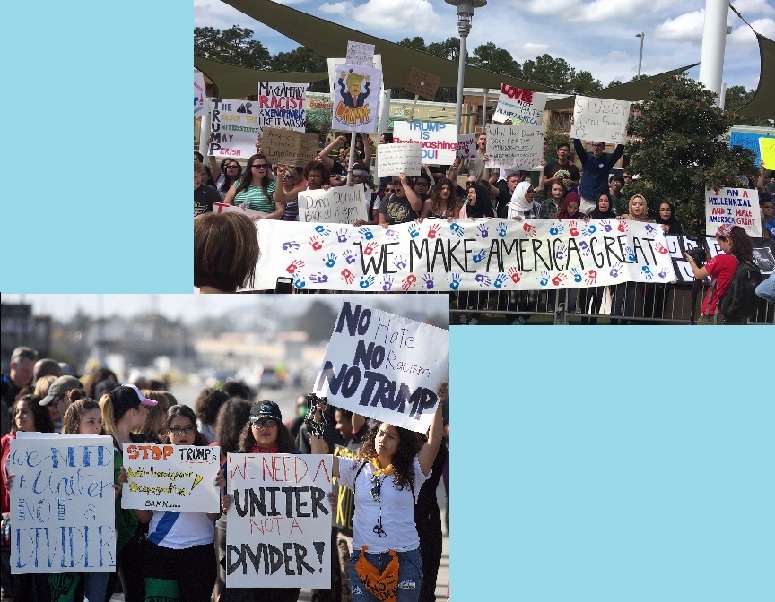 The Westboro Baptist Church (WBC) often are seen at pro-life rallies as well as disrupting the ceremonies of fallen soldiers being interred which would appear as far right at one demonstration and perceived as far left at the other. The reality is that the WBC is a family who believe they know everything about everything with such assuredness and certitude because they honestly believe their messages are derived from Heaven. Their manners and willingness to insult the sensitivities of a family grieving proves that to be otherwise unless their Bible is worded very differently than mine and likely most of yours, dare we say all of yours. Unfortunately for the progressive left, their message is plain, clear and unmistakable. They won the election and damned be the rules. So what if we knew the rules ahead of the election, they did not go our way and thus must be corrected. That is their message on its face value, but is there another message hidden within their rhetoric? If you were successful, somebody along the line gave you some help. There was a great teacher somewhere in your life. Somebody helped to create this unbelievable American system that we have that allowed you to thrive. Somebody invested in roads and bridges. If you’ve got a business – you didn’t build that. Somebody else made that happen. The Internet didn’t get invented on its own. Government research created the Internet so that all the companies could make money off the Internet. The entire Democrat Party stated it clearly when they refused any Republican amendment to the Patient Protection and Affordable Care Act (PPACA) and passed it in both the House of Representatives and the Senate without a single Republican voting for this universal government guaranteed and funded, sort of, healthcare. When this fails, and it is failing, then the democrats will insist that healthcare in the United States is broken, which they know they broke, they will claim the only answer is a single payer government healthcare, their aim from the beginning. We know this because it was what Hillary Clinton tried to form into a comprehensive plan when her husband, William Jefferson Clinton, was President. Even the Democrats rejected such a plan back then because they knew they had to make healthcare even more burdensome before the American people would accept an all government system. That was the idea behind the PPACA, to destroy the insurance industry and make healthcare so broken the people would demand something, anything, and that will be when they get the socialist healthcare like Canada, Europe, and Mainland China. Their aims are the same that socialists have chased and imposed whenever and wherever they can take control, and eventually they will take control. The progressive ideals started with Theodore Roosevelt and was crystalized and defined by Woodrow Wilson and carried into programs by Franklin Delano Roosevelt with Social Security, higher Minimum Wage, a federal labor board which dictated prices and virtually all sides of manufacturing to retail which had to be retracted as the people all but revolted carrying proverbial pitchforks and torches to Washington through the voting booths. Lyndon Banes Johnson gave us the Great Society which was far less great, not so much society, not actually civil, but was most definitely socialist and destructive all but permanently destroying many cities and even far more families as much of the aid to poor was a set of demands which demanded that parents be single parents and then they decried there being so many single parent homes, especially in the inner city communities, meaning minority generally and blacks in particular. They claimed that without the Democrats in power the welfare, food stamps and other programs would be taken from the poor should Republicans ever be elected. Since Lyndon Baines Johnson there have been a few Republican Presidents including Nixon, Reagan, George H. W. Bush, George W. Bush and these programs did not disappear but now the claim is President elect Trump will take away these programs as the latest scare tactic. Then President Jimmy Carter decided that instead of having one Cabinet Department of Health, Education, and Welfare he made a separate Education Department as a new Cabinet position and competency and education quality have declined to the point where the United States is near the bottom of the industrial and developed world. The constantly proposed solution has never been to return education to the local level, preferably as close to the individual schools and their communities as possible but to spend more money and with these increased funds they demand that the schools hire people to assist the schools in utilizing these funds. The new hires use up most of the money just in salaries and then bemoan not having sufficient funding to meet the demanded programs, more funding. Schools have gone from a three or four room main office with one Principal, one or two Vice Principals, a relatively small number of councilors, two to three secretaries and the teachers were the hall monitors. In today’s schools many have two or more Principals, numerous Vice Principals, a small herd of councilors, a diversity coordinator, an EEOC coordinator, other coordinators and advocacy positions and all of these people have staffs and investigators, some have police in their halls, and instead of less than half a dozen offices there are now an entire wing of the schools used for administrations. Back before the Department of Education schools had a few necessary officers and that was all but now they have administrations and when you get such a formal title it takes more funding to staff these important administrators who mostly fill out reports demanded by Washington D.C. and half of the teachers teach two or less classes and spend the rest of their time filling out reports to prove they satisfied all the demands on diversity, multicultural education, inclusion teaching and who knows what else. They have changed reading from phonics to whole word recognition where the pupils are taught words by recognition of the symbols, the letters, but the letter have no sounds of their own, they just make a sound in the recognized form of a taught word. If your schools did not teach you some words, then you must not need those words, which is a great way to enforce limitations to thought because without the words how can one express new ideas? Then there is new math because the old math of traditional methods was a failure because it did not use the latest psychologically meaningful method where the student will understand by having images in their heads from this system where every year they try a new approach and then complain that the children are confused and having trouble. The solution is let us try this new, new, new math. 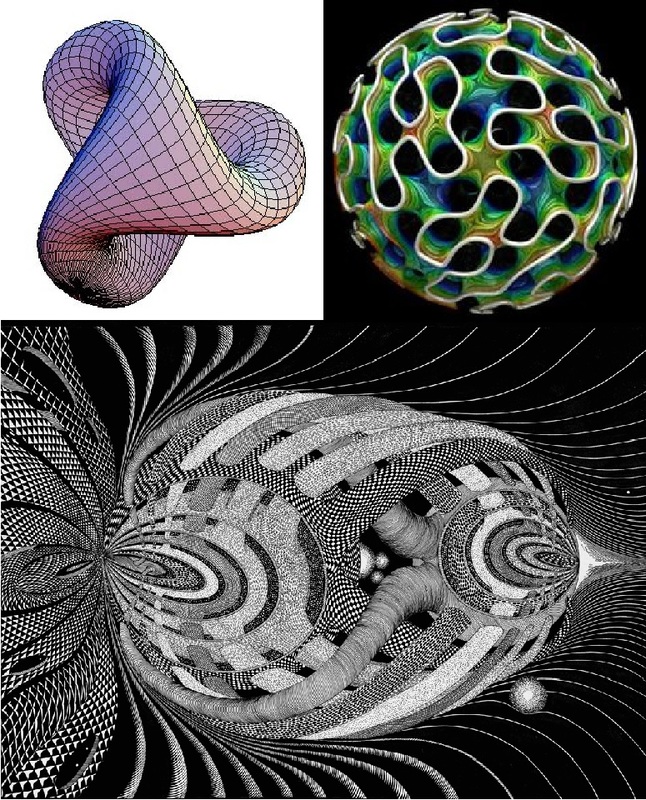 Math as taught today would bamboozle Euclid, confound Aristotle and would have left Bernhard Riemann lost and unable to reinvent geometry such that it could be applied to all surfaces no matter how irregular, and his mathematics enabled Einstein’s theories of relativity to have the necessary mathematical groundwork. Professor Riemann passed away on July 20, 1866 at the age of thirty-nine; a great loss for modern analytic geometry. Just under thirteen years later on March 14, 1879 Professor Albert Einstein was born. I would like to have seen these two men work together to solve the lofty questions of the geometric forms which make up our universe. Oh, did we mention that both these men learned math the old school way, the way we learned math and how one of us was able to take, and still working on fully understanding, a course using Professor Riemann’s book and theorems where n-dimensional space becomes one’s friend or one’s nemesis. Back to another certainty where a great writer posed that if the government determined it to be true and taught everyone that 2+2=5, would that make it true? He also introduced us to Big Brother and a farm with some very strange animals, and the strangest of all were the pigs as they replaced the farmer. This author was a wild and crazy socialist idealist as a youth and became one of the world’s foremost adversaries to socialism as he gained experience, and we would believe wisdom. This man’s name was George Orwell, born on June 25, 1903, and died on January 21, 1950. His change of heart was a result of his observations of the three greatest socialist nations of his lifetime, the Union of Soviet Socialist Republic (USSR), Communist Mainland China, and Nazi Germany and its socialist allies of Spain and later Italy. He predicted or witnessed social upheavals, depredations of morality, financial strident control resulting in shortages all the while enjoying the grandeur that the British Empire and the fledgling nations which sprang from her colonial holdings and how they differed so much from many of the other European colonial nations upon gaining their freedom. He attributed this to the fact that the British did not punish beyond taxes the entrepreneurial spirit and actually often worked at nurturing such exploits. The British also insisted that their colonial entities have adequate schooling to serve the crown to a higher level which brought wealth to both the crown and the colony. The other colonial European powers enforced a strict almost caste system with redistribution of resources always keeping the best possible for their own subjects and the crowns back home giving little regard to the peasant populations, as they viewed them, for all they were worth was a laborers to comply with instructions. Imagine what we would be looking at in eight years had Hillary Clinton won and also achieved reelection. After a second term it would be unlikely that anybody more conservative than Bill Clinton could even imagine getting elected. The system would have been so overwhelmed with immigrants due to at least two if not many more waves of pardons for illegal aliens, there we go again, we mean undocumented workers, or is it citizens sans affirmation. Hillary Clinton had stated she believes that borders are not necessary to define a nation and that citizenship belongs in the ash-heap of history as the antiquated concept it represents. Equality in all things for all with our minders, our betters receiving a double, then triple and even more for their share as they are so much more deserving and their work more demanding scurrying around repairing this, tweaking that. Really there is no better way to describe how it all ends in a socialist nation as all one need do is look around the world and see which nations are stagnant, which are thriving and which are basically defunct and failed. The United States will thrive again; it is just a matter of how long it will take to slash away generation of barnacles from the Ship of State, which in English means ridding the books and the businesses of many of the useless regulations, reports and other government imposed restrictions and impediments. The USSR, dead and buried but still not exactly thriving as many of the detrimental resentments from almost a century of socialism and top down planning takes a while plus having such a steep negative growth rate withering away their population and the poor distribution of power which still remains far too centralized and held by a select few. Then there is mainland China which was doing so poorly they decided that cutting their population size would be easier than growing more food despite having much rich farmlands and good rivers. Their one child policy, a social engineering project if ever we saw one, produce almost two generations of mostly male children and now they are having some difficulties, like nowhere near sufficient women for the men to marry, what to do other than admit your plan backfired as you never anticipated that people would do whatever it took to have one male child. Abortions in China during this period were almost exclusively of girls which simply tell the story; one cannot force policies to have desirable outcomes, only allowing people freedom to reach their own desired outcomes and freedom to pursue life will produce the best results. The greatest example of the absolute bankruptcy of socialism comes from a nation with vast oil reserves and was once the beacon for democracy and free market economy with the highest per capita income in South America. Everybody figured they had it made and their government acted confident in that being true. They had a revolution and Marxists who believed that the Soviet example was the best form of fair governance and that they knew what went wrong and were going to show the world successful socialist governance. They had everything going for them with oil reserves and surpluses of almost everything. That was in the 1998 when Hugo Chavez won election running as a populist candidate. Often socialist progressivist governance comes to power under the guise of popularism which is code for giving people promises of plenty of free stuff. Once in office you take from those with wealth to fulfill your promises of giving the poorer people free things. When you steal from Bob, Bob will not vote for you in the future. But if you steal from Bob and give free things to George, Fred, Susan and a dozen or two dozen, it all depends on how much you give and what you can take from Bob, but then you get all those other people voting for you, so who needs Bob’s vote. Once upon a time there was the Black Robe Regiment which was the name given by the British to the Colonial Preachers who supported American independence. Not only did they preach independence, they very often were officers in the militias against the Red Coats. 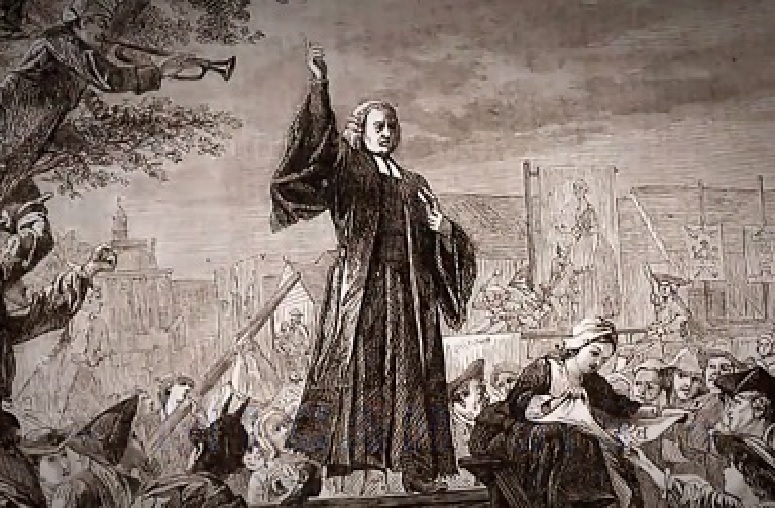 The British did all they could to murder these preachers and many gave their lives for the Revolution but the danger did not curtail the Black Robe Regiment preachers who refused to be cowed and were one of the main inspirations of the American revolution. Their sermons inspired and often their brash and brave actions kept the Revolution alive and brought a number of victories against the odds with their bravery and words motivating their fellow congregants often at the most crucial of moments. The United States owes much of the founding in the fighting and the religious basis of the Founding Fathers and the state legislators whose input and approvals were required in the formation of both the federation of America and then the Constitution which was the foundation for the United States of America. There is a possibility that the Revolution could have failed without the local inspiration and organization which was often centered around the churches and their Black Robe Regiment preachers. All that changed in 1954 at the behest of Texas Senator Lyndon Baines Johnson’s proposed legislation to amend the tax codes affecting houses of worship such as churches, synagogues, mosques, or temples and other nonprofit organizations with 501(c)(3) tax exemptions. The amended tax code limited the freedom of speech by members of organizations and entities who had tax exempt status under 501(c)(3) regulations making any political speech such as supporting a candidate, party or other specified political speech. The amendment to the tax codes was named for its presenter and is called the Johnson Amendment. Particularly prohibited was conducting political campaign activities to intervene in elections to public office or other sermonizing which may be perceived as backing a candidate or party. The language was vague and unspecific enough that many clergy were silenced from mentioning even certain Bible passages near election times as they might be construed as taking sides on a campaign issue and by doing so backing a particular candidate or party. Such brought to an end political preaching from the pulpit, at least in theory as some such still exists but as long as the parishioners are singing the same tune, nobody complains and such activity continues. This was specifically used to target and silence clergy from endorsing candidates. Over time this embargo on political speech became partisan in nature in too many locations as a ban against conservative politicking while backing leftist causes or progressive Democrat candidates. Still, care was taken to never mention any names and instead to often mimic campaign slogans working them into sermons or choosing verses carefully for recitation which would appear to back one candidate’s positions or damn the opposing candidate. Still, clergy still need be far more reserved and careful and a far cry from the history of clergy, especially when one remembers the Black Robe Regiment. Should Donald Trump as president keep his word and successfully repeal the Johnson Amendment thus freeing certain tax exempt institutions and their personnel from conducting any political activities, especially campaigning or endorsing candidates, imagine the consequences. We would witness the liberation of the clergy and the resultant rebirth potentially of a new Black Robe regiment preaching and supporting political positions more aligned with their religious beliefs. There need be no great fears from secularists as they won’t be in houses of worship forced to hear any sermonizing, especially political sermonizing. Rescinding this regulation, expunging it from the tax code, would be a strike for freedom of speech. Placing a political muzzle on the clergy and threatening their tax exempt status was a bad idea from the start, one might even say criminal. 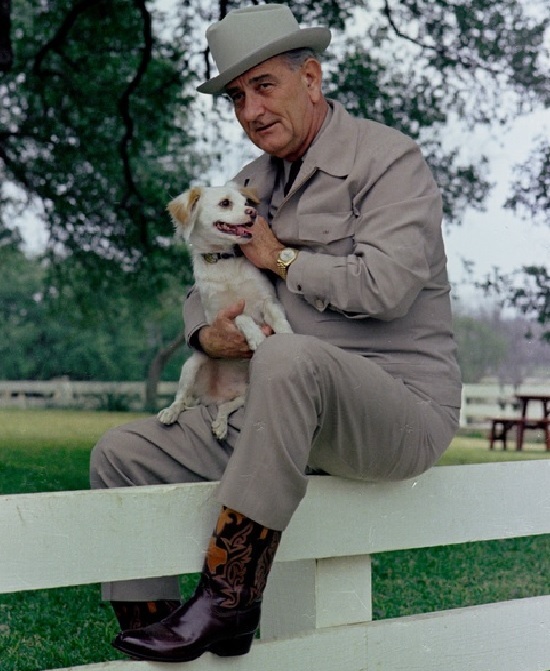 But then Lyndon Baines Johnson was not exactly known for tact or freedom of expression for anybody disagreeing with his views. He was better known for strong-arming political rivals by any and all means at his disposal. This was most evident during his time as President which also served to allow his passing every piece of legislation which became the backbone of his “Great Society” and a remaking of the social safety net and the start of an increased welfare system. Some have blamed this for many societal problems being faced by American society currently. Just maybe a little moralizing before Election Day voting would serve as a positive influence. Just Maybe.